The recipe for a successful wind energy project is surprisingly simple: a good turbine needs to be selected and properly installed in a windy place, with a minimal impact on the surroundings, in particular regarding shadow flicker and noise. This is true for large as well as small wind turbines. The simplicity of this recipe is somewhat deceptive: a successful small-wind project requires careful assessment of the local wind conditions (which can vary abruptly due to nearby obstacles) and expert knowledge of the market of small wind turbines. To investigate the potential for wind energy in the Brussels Capital Region, in particular for small wind turbines, we have measured the wind speeds in different locations in Brussels and found that there are many places in Brussels where wind turbines can be a viable source of sustainable electricity. In particular, the wind conditions are excellent above the roofs of high-rises. 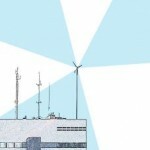 For such buildings, a small wind turbine is a sound investment. In the first two years of the Wintegrate project, we have characterised the vibrations of small wind turbines, studied the structural and acoustic effects of such vibrations on the underlying building, and developed mounting methods designed to minimise these effects. In brief, we find that the installation of rooftop-mounted wind turbines in the Brussels Capital Region is not only economically viable, but also practically feasible. From our contacts with private and public partners, we know that there is a willingness to invest in such wind turbines. 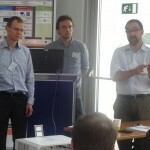 Therefore, the third year of the Wintegrate project has been a demonstrator project, in which a number of pilot installations were prepared, to show the practical feasibility and economic viability of rooftop-mounted wind turbines. 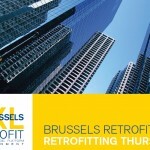 We first performed a thorough feasibility study for multiple sites in Brussels. Then we prepared three requests (i.e. 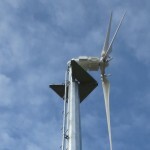 for three sites) for building permits for the installation of wind turbines. These permit requests are now ready to be submitted; the actual submission has to be done by the (private or public) owner of the site. Also the cost of the turbine and the installation are to be borne by the owner of the site or the builder. Apart from the actual permit requests, an important outcome of the project has been the methodology to prepare such permit requests. 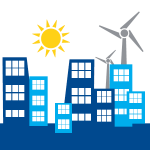 This methodology, together with the available expertise and the establishment of a legal framework for Brussels, will considerably facilitate the uptake of urban small wind turbines in the BCR. To optimise the performance of the turbine, we propose two lines of additional applied research: one to mitigate the yawing errors expected to result from the turbulent nature of the wind and a second one to optimise the concurrent use of wind and solar energy on the same rooftop. With both demonstrator activities and applied research, this project’s main objectives are oriented towards solid economic valorisation. The short-term impact is to supply at least three buildings with sustainable electricity from wind energy. Next to direct economic advantages, the companies or public buildings hosting the turbines will also benefit from a greener reputation. In the medium term, with additional turbines being installed on the pilot sites or on new sites, our know-how will be exported to other cities worldwide. 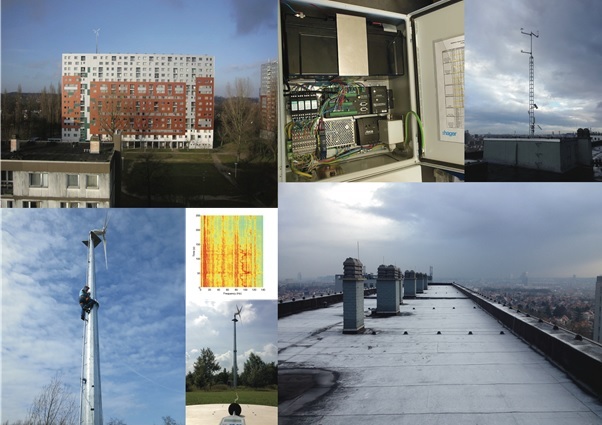 In the long term, and providing the problem of rooftop crowding can be managed, there is the potential for roughly 50 sites in Brussels, resulting in a power production of the order of 1.5 GWh/yr, with obvious economic and sustainability benefits. This project aims to create economic activity over the entire value chain, involving the installation of actual turbines (manufacturers, installers, study bureaus), the preparation of feasibility studies and building permit requests (companies active in consulting and architectural design), and further technological improvement of wind turbines. Figure 1: Mock-up of a small 3.2 kW turbine on top of one of the studied pilot sites: the Peterbos 2 building in Anderlecht. > AIM-ES Guidelines document available now !